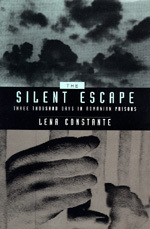 Victim of Stalinist-era terror, Lena Constante was arrested on trumped-up charges of "espionage" and sentenced to twelve years in Romanian prisons. The Silent Escape is the extraordinary account of the first eight years of her incarceration—years of solitary confinement during which she was tortured, starved, and daily humiliated. The only woman to have endured isolation so long in Romanian jails, Constante is also one of the few women political prisoners to have written about her ordeal. Unlike other more political prison diaries, this book draws us into the practical and emotional experiences of everyday prison life. Candidly, eloquently, Constante describes the physical and psychological abuses that were the common lot of communist-state political prisoners. She also recounts the particular humiliations she suffered as a woman, including that of male guards watching her in the bathroom. Constante survived by escaping into her mind—and finally by discovering the "language of the walls," which enabled her to communicate with other female inmates. A powerful story of totalitarianism and human endurance, this work makes an important contribution to the literature of "prison notebooks." Lena Constante, an artist and writer living in Bucharest, won the Association des Ecrivains de Langue Française's 1992 Prix Européen for this book's French edition. Franklin Philip is a freelance translator living in Boston. Gail Kligman is Associate Professor of Sociology at the University of California, Los Angeles.